Whether he’s making comic books about climate change or running from Northern Norway to Paris to raise awareness for the environment, Erlend is a goldmine of information about how anyone (person or business) can be more sustainable. We asked him about his new role, his past and current passion projects and his thoughts on how corporations can support climate activism. Why is the UN Global Compact on Sustainable Ocean Business important for StormGeo? There is a lot of potential within collaboration, both with our clients and other companies who value sustainability as much as we do. With the UN Global Compact, we will be collaborating with 70 different organizations. It’s a wonderful opportunity to take part in this network — learning from each other, collaborating on worthwhile projects and strengthening sustainable practices. There are a lot of companies who actually want to change their behavior for the greater good, not just to have the UN logo on their website. As a group, I believe we can lead the way in showing other companies how they can actually save money by working more sustainably. The corporate mindset is shifting to realize it’s possible to be sustainable without being detrimental to the bottom line. Those not prepared for the renewable shift are getting left behind, as clients would often rather partner with sustainable organizations. Furthermore, when natural disasters occur, the first to be up and running is often renewable energy. This is because most renewable energy sources (as compared to fossil fuels) are not dependent on the electricity grid. Companies already working in this sector are at a huge advantage in these situations. How can StormGeo and other companies implement sustainability internally? There are a lot of different ways. For starters, on my first day, I noticed we didn’t recycle plastic here in the Bergen office. Fixing this is simple and is something any company can do. Becoming environmentally certified is another way to remain accountable. We receive emissions reports from CEMAsys, who do an annual carbon accounting report for all our offices and employees, including for travel. Through this report, we are not only able to look into ways to reduce our greenhouse gas emissions, but also how much we need to offset our carbon. Carbon offsetting is when an individual or company reduces the same amount of CO2 from the atmosphere as what they emitted. This is done by investing the cost of your emissions into sustainable projects. The corporate mindset is shifting to realize it’s possible to be sustainable without being detrimental to the bottom line. Decreasing energy use and switching to more renewable resources is also a concern. At present, 44% of our emissions come from our U.S. offices, mostly due to high electricity usage from non-renewable sources. If these offices switched to renewable sources, we could decrease our total footprint by nearly half. Air travel currently accounts for 30%, as is probably true for many international companies. We have already made strides in decreasing the amount of travel we undertake, by better utilizing online meeting tools, as well as decreasing the footprint per employee in general. Erlend leading the Pole to Paris team through Norway. In 2015, you ran 3,000 km from Tromsø to Paris over four months to raise awareness for climate change ahead of the UN Summit on Climate Change. How do you feel when looking back on that amazing feat? I still get goose bumps when I think about how I met up with my friend and fellow scientist, Daniel Price at the fountain beneath the Eiffel Tower. Daniel had undertaken a 7.5 month-long journey by bike from New Zealand as part of the Pole to Paris awareness project we founded. It was such an emotional meeting, knowing what we had both been through over our months-long journeys to get there. I was also in a lot of pain, having basically torn the entire cartilage in my knee. But that moment was well worth it. When I started the project, I was feeling so demotivated by all the recent news, as many people are probably still feeling today. It was obvious to me how important it was to act on climate change now rather than later, but no one was taking any action. Through Pole to Paris, I was able to be out in nature and communicate with thousands of amazing people who really helped me turn my disposition around. When I was struggling through excruciating pain and wanted to quit, I thought about those who had been supporting us along the way. Whether it was giving us a place to sleep, supplying us with food, or even just sharing encouraging words on social media—the things we don’t get to see in the media—this was what carried me across the finish line. Members of Pole to Paris finally meeting at the end of their journeys, near the Eiffel Tower. Have we made progress since the Paris Accord? Yes and no. Politically, it feels like we’re moving backwards. Certain countries are now leaving the Paris Accord and all over the world, countries are stepping away from sustainability. On the other hand, parts of the world are continuing to move forward, especially in terms of local initiatives. Governor Brown in California is a great example of this. He’s showing that it’s possible to continue the fight on climate change despite federal regulations supporting the opposite. Companies are also seeing the economic benefit of going green and cutting emissions, which creates huge change. It can be difficult for those on opposite sides to have meaningful political or environmental discussions. How do you recommend people approach this? 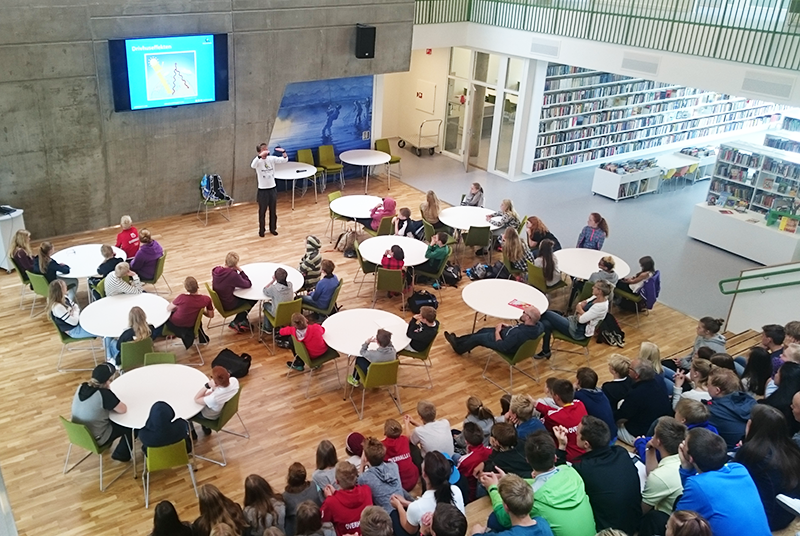 Erlend giving a school presentation on climate change. You need to find a common base. A farmer, for example, is interested in his child’s future or next year’s yields. I avoid immediately talking about climate change, which can have a negative connotation for many people. I try to look for common values such as the weather, family or security. Security is a huge issue worldwide, considering the existence of climate refugees and wars over water. My strategy is always to start from a common base and see where we can go from there. The most important thing is to listen, to try to understand why people feel the way they do. By establishing a connection, we establish mutual trust. It’s also important to be gentle with the topic of climate change and try to focus on the positives—avoiding doomsday pictures of starving polar bears. People get overwhelmed by the negatives and feel like there’s nothing they can do. But there is so much we can do. By talking about what’s actually possible for them, you ignite peoples’ motivations. What is something most individuals could start doing today? The average person can offset the carbon emissions they produce from flying. If you type in your journey on myclimate.org or CEMAsys.com you are given the opportunity to invest in clean energy sources or other projects that will decrease global greenhouse gas emissions. Initiatives like this deter people from frivolous travel. Eating a vegan or vegetarian diet is another good way to reduce emissions because you will cut food-related emissions by 60% for veganism or 40% for vegetarianism. Buying food locally is also important, as is recycling food waste to make compost. But recycling depends on every person. We all have different activities, hobbies, etc. There is no silver bullet. People get overwhelmed by the negatives and feel like there’s nothing they can do. But there is so much we can do. Regarding energy sources, here in Norway, for example, we can easily use 100% renewable energy to power our homes. It’s very affordable. If we do this, we are also encouraging companies to create more wind farms, solar farms, etc. When we use customer power like this, politicians are pushed to make changes. You have been called a climate activist. Is there a place for climate activism in corporate culture? I prefer to call what I do science communication to avoid the negative connotation that has been built up around the word activism. When I think of activism, I think of aggressive organizations, with whom I’ve actively chosen to not partner with. Even though I may like what they stand for I don’t always like the way they do it. As far as climate science within corporations goes, I’ve personally seen companies becoming more receptive to sustainability and climate science over the past few years. When we did Pole to Paris, some companies did not want to be sponsors because of our stance on climate change, which was disheartening because it felt like companies didn’t trust our credibility as scientists. However, when we got the UN onboard, we knew we were on the right track. One of the most important aspects of my contract with StormGeo is the continuation of climate outreach. The company is actually encouraging me to continue my climate research and communications. Even oil and gas companies, who have typically had a bad reputation regarding sustainability, are now more receptive to green initiatives. This is in part because they can no longer deny the obvious and they know they need to be part of the solution. But we still have a long way to go. We have to work with everyone if we are to fight climate change. Are you still involved in the climate outreach that you started with Pole to Paris? I work a lot with climate outreach both within academia, by speaking at conferences, and with the general public. As climate researchers, it’s important for us to engage with people outside the “academic filter bubble.” It’s too polarizing when people within the bubble understand what’s needed, but those outside of it don’t always trust or feel connected to the research. We as researchers have a responsibility to bridge this gap. One of the ways I’m trying to do this is by creating a manuscript with my Pole to Paris colleagues on how climate researchers and scientists should behave in a “post-factual” society. I am also looking into creating a debate on how to train up-and-coming scientists on this kind of outreach. At present there is too much focus on getting published and not enough on communication with world around us. Do you have a current passion project you are working on? I’m always looking for new ways to communicate climate science. At the moment, I’m working on a comic book with climate action and climate change stories from around the world. I’m doing this with a German post doc student I met at a workshop on storytelling in science. One story features the Maasai people of Kenya. 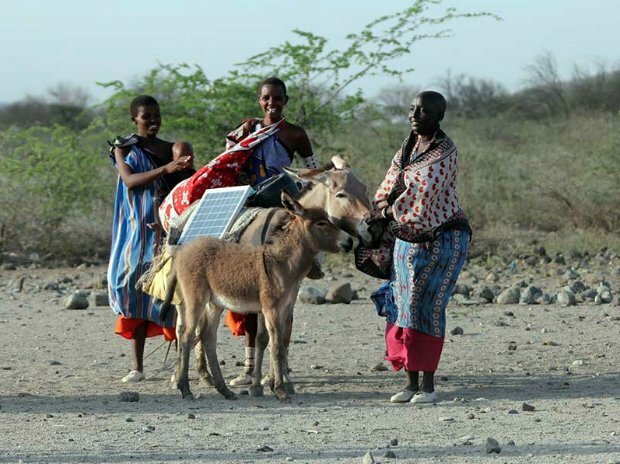 Many of them have never had access to energy, but after being introduced to solar energy, they put panels on their donkeys and roofs. They can now use LED lights at night so children can do homework in the evenings. Lights also scare hyenas away from their cattle and they can prepare food more safely on cleaner stoves. All the stories and drawings are finished and we are hoping for publication in 2019. We’ll start with an English version but may also translate the book into other languages. We’re currently looking for sponsors for the project, so anyone interested can get in touch with us. One of the easiest ways to positively impact the environment is to start with the food you eat. According to the UN, we have 12 years to limit the impact of climate change before irreparable damage is done.